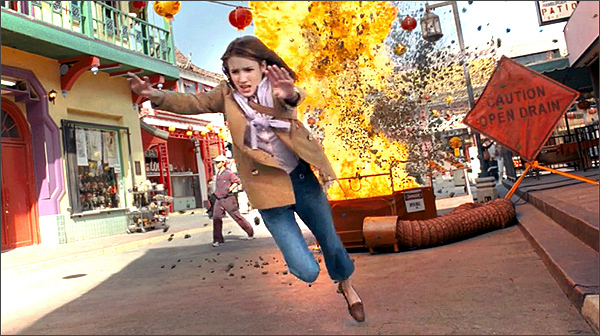 2007 movie, "Nancy Drew", was filmed. [0:37:19] - After a brief driving shot (through the Lancaster desert), they go to the “Twin Palms Spa & Bungalows” (which Nancy found out about via the spa's palm tree logo). But the manager there tells Nancy that the records she wants to see were lost in a fire. This is supposed to be way out in the Mojave Desert, near Morongo Valley, but in reality, this "spa" is right in the heart of Hollywood. This is actually the pool/patio at the Hollywood Roosevelt Hotel, at 7000 Hollywood Blvd., where you'll find the poolside Tropicana Bar. That's right across from Grauman's Chinese Theatre. The hotel is where the very first Academy Awards night was held. The pool is located behind (southwest of) the hotel. Here is a Google StreetView of the hotel. And here is a Google Photosphere of the pool at night. 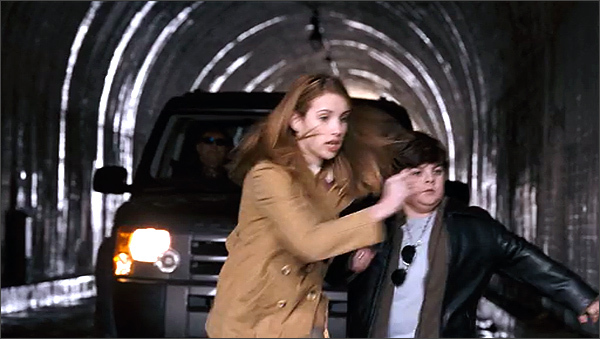 [0:42:58] - Nancy and Corky are walking through a tunnel when a car suddenly appears and attempts to run them over. 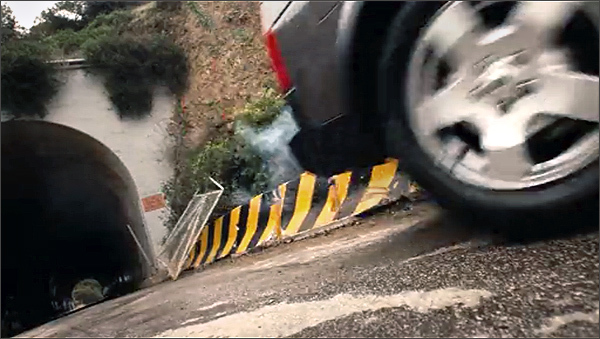 They manage to make it out of the tunnel just in time to leap into the bushes and escape the oncoming car. Here is a Google StreetView of the tunnel. This is the same tunnel used in "The O.C." (in the episode where Marissa was killed), and it was also seen as the entrance to Toontown in Disney's "Who Framed Roger Rabbit? ", as well as for a classic skateboarding scene in "Back to the Future". They escape from the east end of the tunnel. 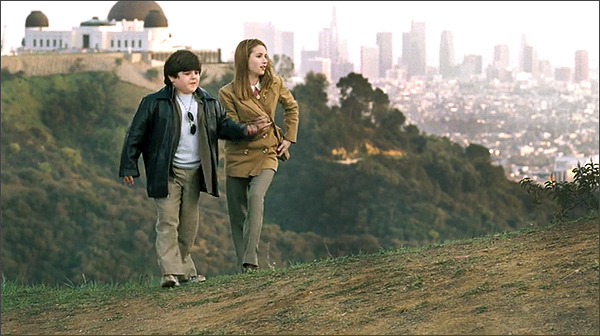 [0:43:50] - After escaping the car, Nancy & Corky emerge on a hilltop, overlooking the city below, with an observatory on the next hill over. That observatory (the domed building seen in the background) is The Griffith Park Observatory, located (as its name suggests), in L.A.'s Griffith Park, at 2800 E. Observatory Road. The Griffith Observatory has been seen in many Hollywood movies, including "The Terminator", "The Rocketeer" and "Rebel Without a Cause." Here is a Google Streetview of the Observatory. And here is a PhotoSphere showing that hilltop view. [0:44:53] - In the city, Nancy surprises Dehlia Draycot's former agent, a powerful and obviously busy businessman named Mr. Biedermeyer. 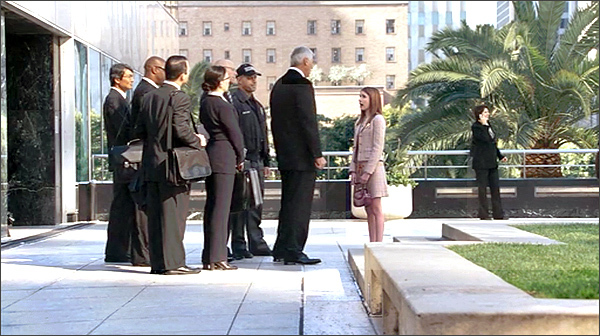 This scene was shot at the Citigroup Center, at 444 South Flower Street, in downtown L.A. The camera is looking south/southwest, towards the Central Library. Here is a Google Streetview of the center. [0:49:25] - Nancy goes to Chinatown, where she has lunch at a patio restaurant with Corky, Ned, and where she is joined by the two catty girls from her school. Then she goes into a nearby store, where she tries to find Dehlia Draycot's will, which she believes may be hidden in a Chinese box. 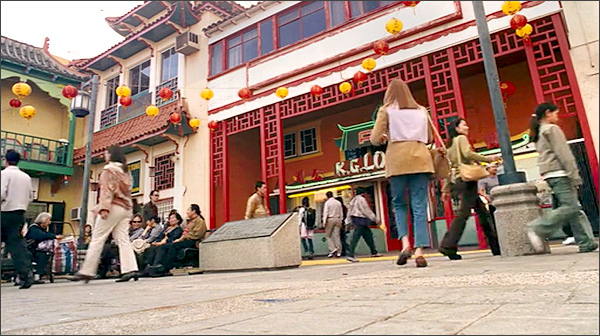 This was shot in L.A.'s Chinatown Central Plaza. You'll find this complex of ethnic shops and restaurants just north of downtown. It lies between N. Broadway (on the east) and N. Hill Street (on the west), just north of W. College Street. In the photo above, the camera is looking north up Sun Mung Way, towards Gin Ling Way. 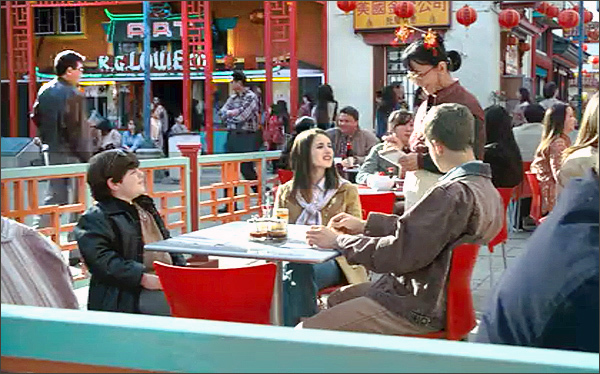 Although there are many genuine Chineserestaurants here, I'm pretty sure that they built this particular sidewalk cafe from scratch, as a movie set, on the open street/plaza across from (northeast of) K.G. Louie, just inside (west of) the east gate on Gin Ling Way. 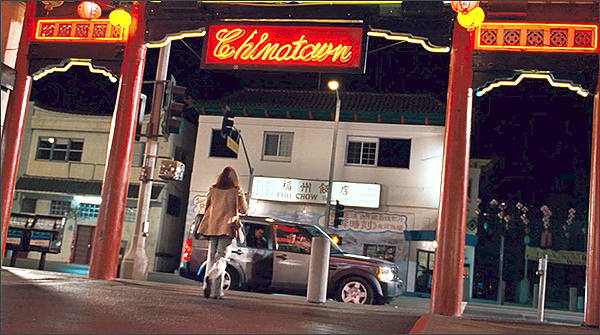 The streets around Chinatown, such as Alpine & Spring, are also seen, when Nancy and her friends are involved in a car chase (while keeping below the speed limit). [0:50:48] - She enters a shop in Chinatown (the sign says "K.G. 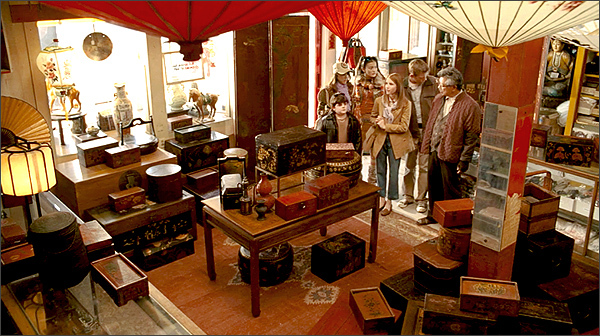 Louie"), where she and her friends look through a zillion Chinese boxes, trying to find Dehlia Draycot's hidden will. The K.G. Louie box store we see her enter is located at 432 Gin Ling Way, in Chinatown's Central Plaza. That's it's real name. In reality, the store sells imported giftware, artists supplies and Zodiac-related souvenirs. But that official address on Gin Ling Way is for the store's north entrance. The entrance that we see in the photo above is on the east side of the store, on Sun Mung Way. [0:53:00] - Nancy discovers a bomb, and tosses it into a sewer drain before it explodes. This was also shot on Sun Mung Way, just south of K.G. Louie. The camera is looking north. [1:11:27] - We see Nancy and her dad, with Jane (Dehlia Draycot's illegitimate daughter), walking through the halls of City Hall, then down its steps, and out past an area with arches, where they meet Mr. Biedermeyer again. 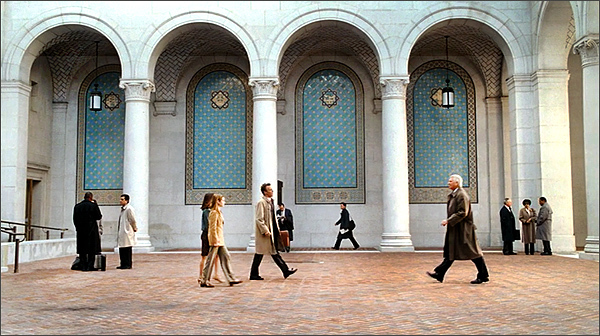 This was shot in Los Angeles City Hall, at 200 N. Spring Street, in downtown L.A. The camera is looking east from Spring Street. Here is a Google StreetView of City Hall. 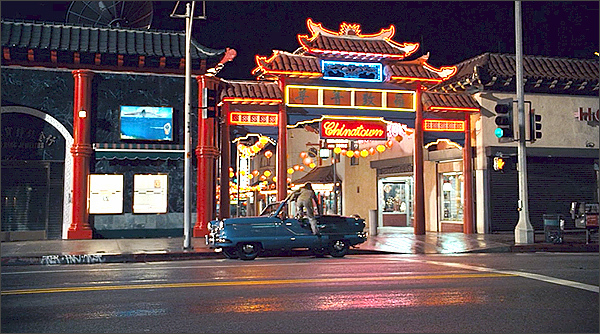 Nancy is walking later in Chinatown, talking to her dad on the cell phone, when she is grabbed by the bad guys under a Chinatown gate. Here is a Google StreetView of that west gate. [1:16:06] - After being kidnapped, Nancy wakes up inside an old movie theatre, lying in one of its back rooms, on a pile of red plastic marquee letters. The bad guys who kidnapped her are sitting in the theatre's main auditorium. Nancy sneaks past them by walking along scaffollding above their heads. 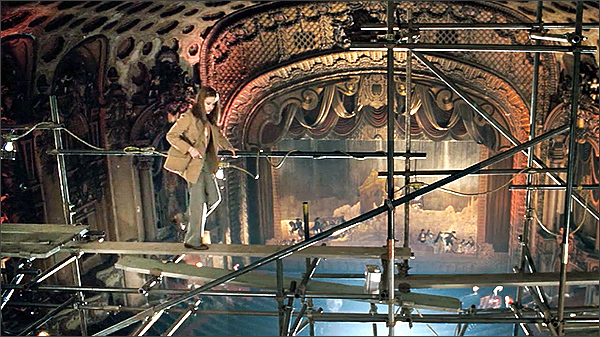 This was shot inside The Los Angeles Theatre, at 615 S. Broadway, in downtown Los Angeles. Built in 1931, the now-closed movie palace is one of the grandest, most ornate movie theatres you could imagine, with a lobby that looks like a palace. The theatre itself is no longer open to the public (it's mainly used for filming now), except once a year, during the "Last Remaining Seats" program. And here is a Google PhotoSphere of the theatre's grand interior. [1:20:11] - To make her escape from the goons who kidnapped her, Nancy jumps (from a theatre alley) on top of a passing trash truck. In real life, that alley is right around the corner, on the 6th Street side of the theatre. Here is a Google StreetView of that escape alley. After her escape, later at [1:20:28], she returns to that same Chinatown gate (where they grabbed her) and jumps back into her roadster. Here is a Google PhotoSphere of that west gate. 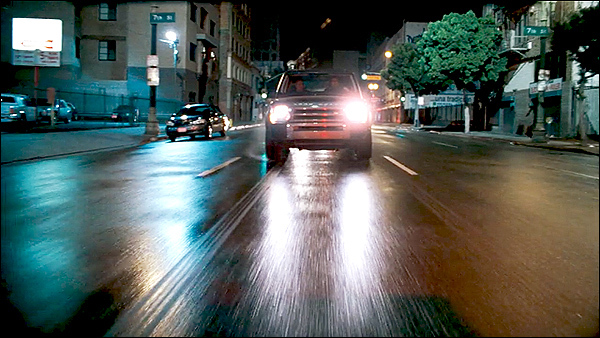 [1:20:30] - During her escape attempt, she is first seen driving in her roadster south on Main Street, past 7th Street, in downtown L.A. (a spot which is about two blocks east of the theatre). Here is a matching Google StreetView of that intersection. She makes a U-turn, and is then [1:20:56] seen heading north up Main Street at 8th Street. 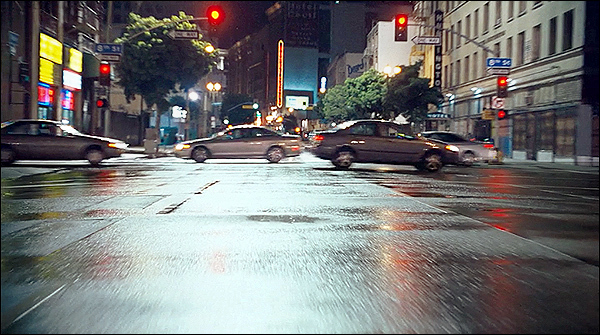 Five seconds later, her car spins out at Main Street & 8th, and smacks into a parked car. She lands up, unhurt, with the police in a hospital, at [1:21:12], where her father shows up to scold her. Later, Mr. Biedermeyer, the agent, also shows up there, and winds up kidnapping them both. 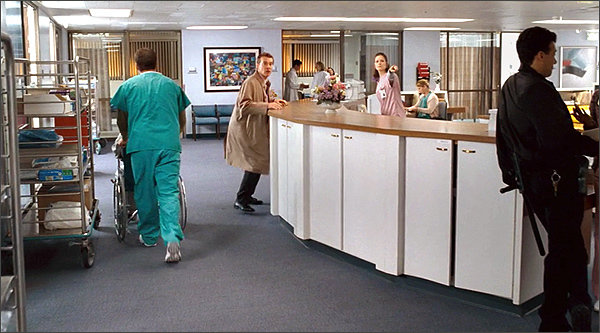 These hospital scenes were shot in St. Luke's Medical Center, at 2632 E. Washington Blvd, in Pasadena. St. Luke's is an abandoned hospital that is now used almost exclusively for filming – and it is used a lot. Here is a Google StreetView of St. Luke's. 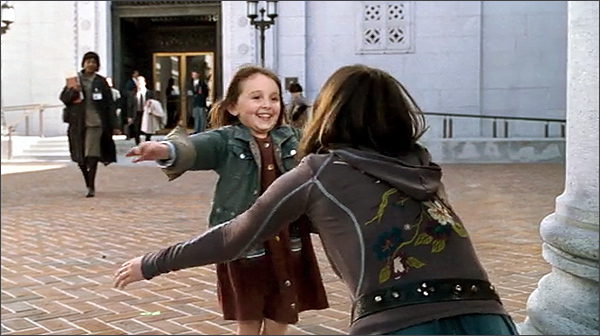 [1:32: 30] - The movie ends with Nancy and her father back in their hometown of River Heights, which is, of course, South Pasadena in real-life, and we see them in front of that Drew home again, with her boyfriend, Ned. More Nancy Drew locations back on the first page! The photos on this page are stills from the DVD of "Nancy Drew" and are copyright Warnerr Bros.